Fiction – paperback; Serpent’s Tail; 159 pages; 2015. Review copy courtesy of the publisher. — I’ll wager a year’s servitude, said Apollo, that animals — any animal you choose — would be even more unhappy than humans are, if they had human intelligence. — An earth year? I’ll take that bet, said Hermes, but on condition that if, at the end of its life, even one of the creatures is happy, I win. Fifteen Dogs follows the antics of the dogs, some of whom reject their new ability with language and revert back to the “old dog ways”, and through a series of set pieces, rather than a typical story arc, shows how their relationships with one another and humans changes as a result of their newfound intelligence. Sometimes this is quite horrifying — one set of dogs, for instance, leads another set to their deaths — but only goes to show where the idiom it’s a dog-eat-dog world comes from! But at other times it’s quite touching — the deep friendship that develops between Majnouin, a black poodle, and his human owner, Nira, for example. Of course, I can’t dismiss Fifteen Dogs entirely. While fables aren’t my kind of thing, and I struggle with stories that demand that I suspend belief (even if it’s just for 150 or so pages), this novella does explore some interesting ideas around language (one of the dogs, for instance, composes poetry), cultural codes of conduct, emotion, individuality and morality. And if you’ve ever had a dog or own a dog (or commission training articles about them, like I do) there’s plenty of behaviours to recognise (and occasionally laugh about) in these pages. And then there was the room where the humans bathed and applied chemicals to themselves. The bathroom was fascinating, it being astonishing to watch the already pale beings applying creams to make themselves paler still. Was there something about white that bought status? If so, what was the point of drawing black circles around their eyes or red ones around their mouths? 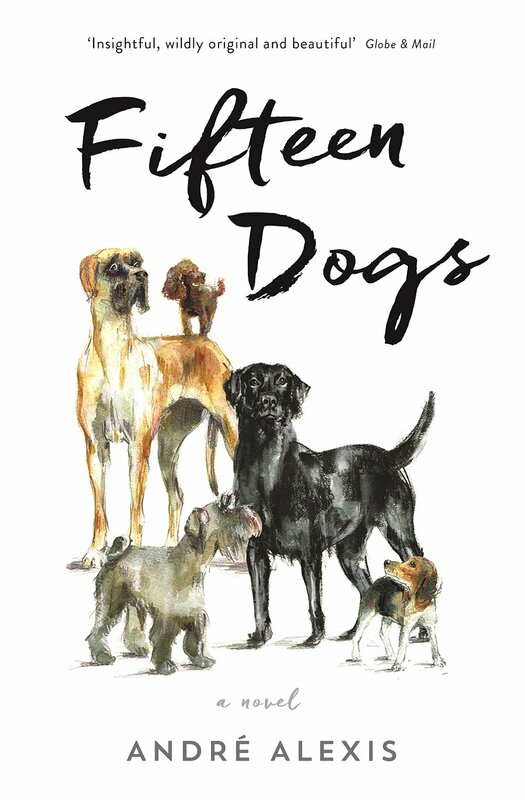 Please note, Fifteen Dogs is not yet published in the UK. I was fortunate enough to get an advance copy, sent to me unsolicited. It will be published here on 5 November. Congratulations to André Alexis, who was awarded the 2015 Giller Prize last night. You can read more about his win on the official Giller Prize website. I am relieved to read your review. I can feel comfortable avoiding this book. I may go see him read at my favourite bookstore during our upcoming writer’s festival with patrick gale and someone else, I can’t remember. It’s a free event in a line up with little to interest me this year. I read a book called Pastoral by Alexis last year and I was so disappointed. He had a great premise but rather than push the envelope, leave questions or challenge the reader it ended up copping out and ending so unsatisfactorily. I have to be so careful with Canadian lit but so often I feel let down by a book that has a great premise, some great writing but fails to follow through. This one only sounds marginally interesting even. It’s funny, isn’t it? I haven’t yet seen a bad review of this book, but honestly, I so struggled to like it. It took me two long weeks to read. Every time I put it down I just didn’t want to pick it up again, the result being that I’ve barely read any fiction for the past fortnight. A palatable way of engaging people in philosophical questions, perhaps? But unless there are original insights it hardly seems worth the trouble. Well, it is full of original insights, but it just didn’t gel for me. I didn’t like the book but I did appreciate it. I just cannot bring myself to read it after checking out the cover copy. Not my cup of tea. Thanks for making me feel better about scratching it off my too-read list. I DO recommend All True Not a Lie In It by Hawley (On the Giller longlist too). Loved it. I was thinking of reading this one next, but you’re really not selling it to me, Kim! I do think the author’s project sounds interesting – as I understand it this is the second (after “Pastoral”) of five planned books to resurrect largely neglected literary forms, though you do have to wonder if maybe there is a reason they were neglected in the first place. Plus, I’d have been more interested if he’d written “Fifteen Cats”. It does however sound like a perfect fit for this year’s Giller longlist, which seems to have a focus on formal experimentation and linguistic creativity (it’s almost like a Goldsmiths Prize shortlist). Of course, that kind of thing doesn’t always work – I thought “Outline” was beautifully written and endlessly thought-provoking, but I’m not sure Rachel Cusk quite pulls off her central idea of having a passive narrator who exists as a kind of negative space at the heart of the novel; nor am I so far wholly convinced by “The Winter Family” which seems to posit the idea that rather than the world being essentially rational it is instead a chaos upon which some vainly try to impose order – it’s a compelling read but might just be an excuse to write a Tarantino-esque story of violent men doing very violent things (Cormac McCarthy it isn’t); and “If I Fall, If I Die” is an unsuccessful marriage between a powerful adult story about mental illness, and a by-the-numbers children’s mystery adventure. But the rest of the list is so far fabulous – “Close to Hugh” is an absolute joy full of puns and wordplay in which almost everything has multiple meanings, but also has real heart; “All True Not A Lie In It” is a superb piece of literary ventriloquism that brings Daniel Boone thrillingly to life and explores the disconnect between man and myth; “Daydreams of Angles” is endlessly inventive and fun (and I say this as someone who is not a fan at all of the ‘adult fairy tale’); “A Beauty” is deceptive – I started reading thinking it was going to be one kind of book and it turned out to be something quite different and much more interesting; and “Confidence” is a set of solid well-told stories that bitingly satirise a vacuous coke-snorting ultra-hip section of society but at the same time is written with a compassion that makes you care about them. I didn’t realize that Alexis was doing a series of 5 books – sounds interesting! Interesting observations, David. I wonder if that’s the John Boyne effect? He seems to like wordplay/puns etc. I’m going to jump in here and say that I loved Fifteen Dogs. I am not usually a fan of fable-type stories, either, but I thought Fifteen Dogs was original and creative, thought-provoking and fun (except for the parts that are obviously not fun). Looking forward to hearing about some of the others! What’s next? It seems I may be the only person who doesn’t like this book. Just looking at the reviews on GoodReads makes me realise that I’m completely out of sync with public feeling on this one. Oh well. I think it’s the kind of book that can easily go both ways. I love the cover that you posted! Way better than the one here. I’ve only reading glowing reviews of this book but I’ve shied away from it. I think I feel ok continuing to avoid it now. So thanks! Yes, it’s a gorgeous cover and a lovely object to hold, with French flaps and a “canine dramatis” on the back cover, to which I constantly referred. Such a shame I didn’t think much of the contents. This is the first negative review I’ve seen for this book, but you’ve actually made me want to read it more! I like books that are a bit different and anything that examines our human traits in this way is always eye opening. I look forward to trying it soon. Be interesting to see what you make of it, Jackie, but clearly it wasn’t one for me. GoodReads is chockablock with positive reviews, which makes me wonder did I miss something? I finally finished this last week, after it had won the Giller. Whilst I think I liked it a bit more than you did, Kim, I can’t say I was hugely impressed by it either. I liked the idea of it more than I perhaps liked the execution: the dogs speaking English was a bit daft but the aspect I liked least was the appearances by the Greek gods – granted that is the whole set-up of the book but I prefer my fiction to be a bit less fanciful. Superior beings in fiction almost never work, what with being written by mortal humans and everything. I also suspect I might have got more from it if I was a dog person and knew dogs better (‘Fifteen Cats’ would have been more up my street!) – Lauren B. Davis (‘Our Daily Bread’ etc.) wrote a review of it on Goodreads where she questioned the way Alexis writes about dog behaviour and his focus on dominance. Still, I did like much of the writing in the book, and I thought Alexis developed the dogs’ different characters well, so I’d definitely be open to trying more by him. Having read all twelve of the longlisted titles, I’d rank ‘Fifteen Dogs’ maybe 8th, and of the shortlist I preferred both ‘Martin John’ and ‘Daydreams of Angels’. Thanks for coming back and leaving a comment, David. It’s an interesting idea for a book, but I agree, the execution is a little odd. I hated the whole Greek god aspect of it, and the book may perhaps have been stronger (or indeed more likeable for me) if they were left out of it completely! I’m a dog person (though don’t own one) and I recognised a lot of the behaviour detailed here, but it still didn’t make me like the book! Knowing you aren’t this book’s biggest fan really makes me want to read it now – I bought it on spec yesterday, knowing you’d reviewed it, but not having read your review! That’ll teach me if I don’t like it, but I do like a high quirk factor in a book … we’ll see.